With so many great photographic images passing our eyes everyday, do you ever stop and wonder why certain photos are so memorable? In many cases it is not just because the skill of the photographer, but the painstaking work of a behind-the-scenes wizard known as a digital photo retouching artist. It's kind of sad that many of these artists never get the recognition or credit that they deserve. Having seen "before" and "after" photos of many photographers, I can tell you that the skilled digital artist can make a big difference between a "good" and "spectacular" final image. I have had the pleasure of seeing the work of one such master photo retoucher, Scott Dorman of Small Dog Imageworks in action. Since I have known Scott for 20 years (and we have mutual blackmail material on each other), I am sometimes allowed to see his working method. This has given me a great appreciation for the amount of hours, talent and dedication that goes into every photograph that he transforms. There are no secret formulas. Each photo calls for something different. If you ask him, he might tell you that "Scott Dorman of Smalldog Imageworks specializes in high-end, professional digital retouching, seamlessly blending art with photography for photographers and advertising agencies." If you ask me, I think he performs magic with pixels creating unbelievable photo illustrations and pushing good photography to new heights. I am not the only one who has noticed either. Scott Dorman's work has graced the cover and pages of Communication Arts magazine and others, countless ad campaigns, packaging and huge Times Square monster billboards. I would almost bet money that you have seen one of his images somewhere. 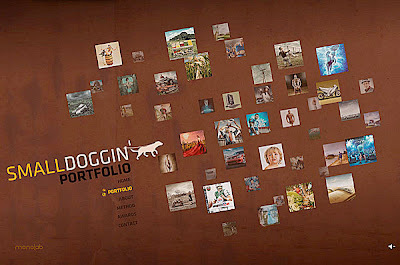 Don't believe me, check out Scott Dorman's new portfolio web site at www.smalldoggin.com. Pack a lunch because you might be there a while checking out the cool images. Want to go retro? Check out his previous site at: www.smalldogimageworks.com.